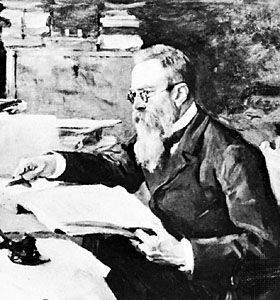 Nikolai Rimsky-Korsakov (18 March 1844, near Novgorod – 21 June 1908) was one of the The Five and not the least. We know him as the composer of the Russian Easter Festival Overture. 🎶 Easter is/was a very important feast in Russia. You may have seen painted Russian eggs and a few of the 50 jewelled “Imperial” eggs Fabergé created for the Tsar’s family. Rimsky-Korsakov was/is the most scholarly member of The Five and, consequently, their editor, Mussorgsky’s editor mainly. However, although his music exemplifies The Five’s attempt to express the Slavic roots of Russia’s music, he infuses into the music of Russia the sophisticated polyphony of European music, developed over centuries. Conversely, Russian music, the music of The Five and other Russian composers, would have a very real and important impact on western music. The quotations above point to the exotic nature of the music of the Slavic composers, The Five: the Russian East. We have heard Alexander Borodin‘s In the Steppes of Central Asia (Mongolia). 🎶 Russia reaches from Europe to the Orient. The Five used folktales, a characteristic of 19th-century music and literature. These tales, many are fairy tales, were not necessarily Russian – Scheherazade isn’t, but they were the Russian expression of tales that overrode nationalism and belonged to a very distant past, millennia. Rimsky-Korsakov put his superior knowledge of orchestration, polyphony, blending many voices (soprano, alto, tenor, bass), into the service of a local idiom. 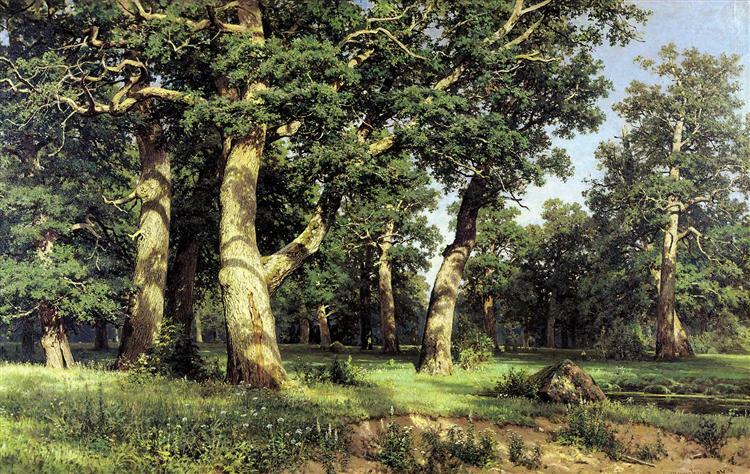 Besides, although the Slavic composers attempted to express the Slavic and exotic aspects of the music of Russia, Romanticism, a 19th-century movement, was characterized by a degree of exoticism. Rimsky-Korsakov composed Capriccio Espagnol, 🎶 and Victor Hugo (1802 – 1885) wrote the poem Les Djinns, published in his 1829 collection of poems, entitled Les Orientales. Yet, Hugo also wrote The Hunchback of Notre-Dame (Notre-Dame de Paris), published in 1831, locating France in the Middle Ages, which he considered a more genuine and national past, than the plays of Jean Racine (1639 – 1699). He also modified the alexandrine, the “noble” twelve-syllable verse borrowed from the 12th-century French Roman d’Alexandre, featuring Alexander the Great, king of Macedonia. 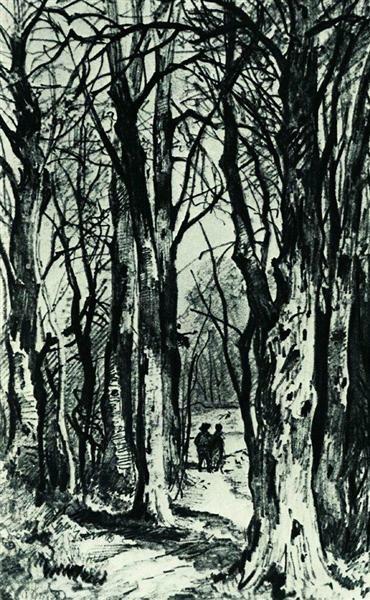 As well, Hugo ensconced French literature into Gothic fiction, a characteristic of Romanticism. Rimsky-Korsakov (1844 -1908) had a passion for the sea, which he had yet to see when he joined the Imperial Russian Navy. But his older brother, Voin Rimsky-Korsakov (1822 – 1871), had travelled to lands far away. Voin graduated from the School for Mathematical and Navigational Sciences in Saint Petersburg, and so would Nicolai who admired his brother. However, Nicolai would combine two careers. He would be a naval officer and a composer, and, as a musician, he would introduce the Russian East into European music. That would be his gift to classical music. As we have noted in posts about enlightened despots, Russia looked to Europe. 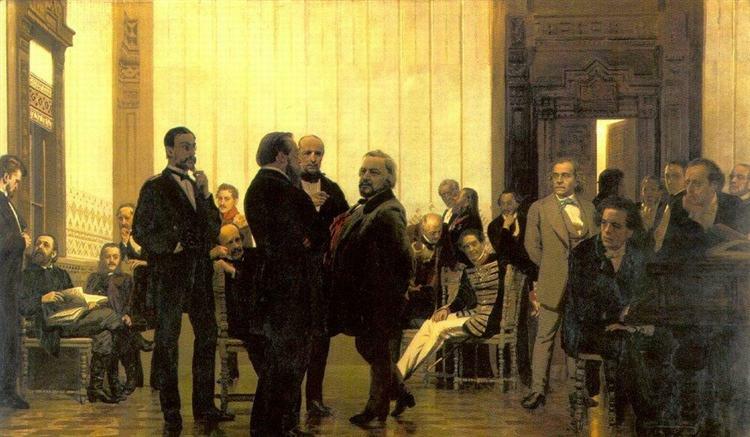 Rimsky-Korsakov and other Russian composers, The Five, are less European than Tchaikovsky, but they composed music where east and west interact. Chief conductor of the Russian symphony concerts between 1886 and 1900. By turning to European music, Rimsky-Kosarkok’s relationship with the four of Slavic composers became that of editor. Had he not revised and enriched Mussorgsky’s opera Khovanshchina, it may no longer be performed. We have heard at least one segment of the introduction to Khovanshchina. Dawn over the Moscow River 🎶 is magnificent. One could suspect that Rimsky-Korsakov’s editing miffed his colleagues. I doubt it. He may be best described as a big brother to brilliant composers who were less learned than he was. Writers often need a good editor, and the same is true of musicians. Rimsky-Korsakov would not have edited Mussorgsky, had Mussorgky’s music not been the product of a genius. We now find ourselves returning to Diaghilev’s Ballet Russes (1909 – 1929). Other favourites are The Tale of Tsar Saltan, Sadko, The Snow Maiden (1882) and other folktales and tales. But I have selected his Procession of the Nobles as today’s choice. Rimsky-Korsakov was a member of the nobility. Nikolay Rimsky-Korsakov, detail of a portrait by V. A. Serov; in the Tretyakov Gallery, Moscow. In the second half of the 19th century and the first quarter of the 20th century, Russia changed dramatically. The Emancipation of serfdom, in 1861, led to a major social upheaval. Ironically, several former serfs had to pay for the piece of land they had been cultivating for centuries, but more importantly, an agrarian society was industrialized. (See Industrialisation of Russia, Wiki2.org.) Many Serfs became factory workers whose working conditions were unacceptable. Matters culminated in a massacre known as Bloody Sunday, 22 January 1905. From 3,000 to 50,000 factory workers marched towards Saint Petersburg’s Winter Palace to deliver a petition (←text) to Tsar Nicholas II. Some 4,000 demonstrators, an approximate number, were gunned down or injured by the Imperial Guard. Others were arrested. By the end of Word War I, there would no longer be a Russian Empire. Two revolutions occurred in 1917: the February Revolution and the October Revolution. The Bolsheviks, under Vladimir Lenin, took over during the October Revolution, sometimes called the Bolshevik Coup. Tsar Nicholas II of Russia (18 May [O.S. 6 May] 1868 – 17 July 1918) had abdicated on 2 March 1917. He and his family were executed during the night of 17 – 18 July 1918. The painting above is immensely foreboding. But let us listen to another part of Mussorgsky’s Khovanshchina, its introduction. Frederick was the son of Frederick William I of Prussia a disciplinarian who did not shy away from beating his son. Young Frederick attempted to flee to England with a friend, Hans Hermann von Katte ( 1704 – 1730), intending to work for George II of Britain. George II was the Duke of Brunswick-Lüneburg (Hanover). Flight was impeded. 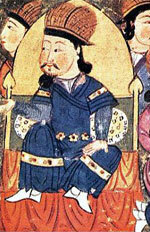 Frederick William I had the two lads imprisoned, at Küstrin. King Frederick William I spared his son’s life, but Hans Hermann von Katte was beheaded and Frederick William I insisted that his son watch the execution. Although Frederick married Elisabeth Christine of Brunswick-Wolfenbüttel-Bevern when he was crown prince, he did not live with his wife. It appears he was not attracted to women. As a very young man, he may have been attracted to boys, but one can only speculate on Frederick the Great’s sexuality. Although he was not attracted to women, Frederick made sure his wife lived comfortably. He was succeeded by his nephew, Frederick William II of Prussia. Frederick’s passion was his “profession,” to quote Catherine the Great of Russia. He was an aristocrat and “born to rule.” Other than his “profession,” Frederick was an excellent musician. He played the flute and was a surprisingly prolific composer. Harmony, counterpoint and form are demanding disciplines. Additionally, one’s melodies are the product of inspiration. Frederick was gifted. Frederick the Great (Wiki2.org) provides a list of Frederick’s compositions. It may not be a complete, but it is very impressive: 100 sonatas for the flute as well as four symphonies, etc. Frederick had a music room at Sanssouci, his castle in Potsdam, and his flute teacher was no less than Johann Joachim Quantz (30 January 1607 – 12 July 1773). Peter the Great and Catherine the Great westernized Russia, but they also organized it. As for Frederick the Great, the most enlightened of despots, he modernized Prussia. All three despots also promoted, to a greater or lesser extent, religious tolerance. King Frederick the Great joined Freemasonry, as did many of his contemporaries. In Prussia, the heart of the future German Empire, it became possible to occupy positions formerly reserved for the nobility. Bourgeois could be judges and senior bureaucrats. Frederick welcomed immigrants and he allowed freedom of the press and literature. Moreover, not only was he a musician, but he was also a patron of musicians and artists. He reformed the Prussian Academy of Sciences. Although it is incomplete, one of Frederick’s finest achievements was the Prussian Civil Code. Civil codes organize a nation. Catherine II the Great of Russia also worked on devising a code of laws. Frederick the Great was a fine and well-educated leader. He believed, however, that his “profession” had made him what he was. It hadn’t. One does not need to be an aristocrat to govern well. In short, Frederick was an exceptional leader and an extremely gifted gentleman, brilliant, who happened to be a king, and a despot. Yet Frederick was also convinced that the Prussian landed noblemen, the Junkers, were the backbone of the state, and he continued accordingly to uphold the alliance between crown and aristocracy on which his kingdom had been built. a half-century-long period of parliamentary governance and increasing civil rights, beginning with Charles XII‘s death in 1718 and ending with Gustav III‘s self-coup in 1772. In 1719, Count Arvid Horn (6 April 1664 – 17 April 1742), President of the Privy Council Chancellery of Sweden, transferred power from an absolute monarchy to a parliament, Sweden’s Riksdag of the Estates, a name used by the Estates when they assembled. Charles XII was childless. He was succeeded by Ulrika Eleonora, his sister, who abdicated because power was in the hands of the Riksdag of the Estates. Her husband Landgrave Frederick I of Hesse-Kassel, a prince consort, would serve as King Frederick I of Sweden until 5 April 1751. Frederick I of Sweden signed the Treaty of Nystad (1721) which ended the Great Northern War (1700 – 1721). Sweden surrendered Swedish Estonia, Swedish Livonia (which had capitulated in 1710) and Southeast Finland (Kexholmslän and Karelia), in exchange for two million silver thaler. The Riksdag of the Estates differs from Britain’s Parliament. It may consist of two parties opposing one another. During the Age of Liberty, the Riksdag opposed the Hats (les Chapeaux) and the Caps (les Bonnets). I noted the role played by the Hats and the Caps in the short version of this post. But I should add that the “Horn Period” was a better Age of Liberty than the period during which the Hats ruled. His strong hand kept the inevitable strife of the parliamentary factions within due limits, and it was entirely owing to his provident care that Sweden so rapidly recovered from the wretched condition in which the wars of Charles XII had plunged her. As for the relationship between the Riksdag of the Estates and the kings who reigned during the Age of Liberty, it reflects to a large extent, the rule of the Hats and the Caps. I have mentioned the Russo-Swedish war of 1741-1743. Sweden, the former Swedish Empire, was defeated and, under the terms of the Treaty of Åbo, it had to cede territory east of the Kymi river to Russia. Elizabeth of Russia demanded that pro-absolutist Adolph Frederick from the House of Holstein-Gottorp be the future king of Sweden. As a result, members of the house of King Frederick I of Sweden, the Landgraviate of Hesse-Kassel were eliminated from the line of succession. The Hats also involved Sweden in the Pomeranian Theatre of the Seven Years’ War. Sweden lost 40,000 men in a war France did not win. Sweden suffered immense losses seeking the “greatness” it had lost. According to the Encyclopædia Britannica, the reason for the transfer from absolutism to its Age of Freedom was “the complete failure of the policy of ‘greatness’ connected with the Carolingian [Charles XII] absolutism.” In 1772, Gustav III‘s self-coup re-introduced absolutism. Gustav III is described as a popular king. He was when he modelled his absolutism on his uncle, Frederick the Great of Prussia’s enlightened despotism. But what of the people’s will? They [enlightened desposts] typically instituted administrative reform, religious toleration, and economic development but did not propose reforms that would undermine their sovereignty or disrupt the social order. The Age of Liberty‘s early Riksdag of the Estates took all powers away from monarchs. This would change as Swedish democracy developed, a process usually marked by trials and errors. The Age of Liberty can be viewed as an experiment in democracy. Matters change. Arvid Horn’s grew increasingly neutral, and his neutrality was opposed. Ulrika Eleonora, Charles XII’s sister, abdicated because she refused to be a figurehead. But, although King Charles XIII was prematurely senile, he was involved in the drafting of the Instrument of Government of 1809, Sweden’s constitution. It was not developed unilaterally and it remained unchanged until 1974. In fact, to what extent was Charles XII an absolute monarch? Voltaire preferred Charles XII to Peter the Great. The form of government instituted in Sweden under King Charles XI and passed on to his son, Charles XII is commonly referred to as absolute monarchy; however, the Swedish monarch was never absolute in the sense that he wielded arbitrary power. Yet, Sweden defeated Russia at the Battle of Svensksund, Gustav III demonstrating leadership and “greatness.” But such “greatness,” Sweden had probably outgrown in its Age of Liberty. This post is an abridged version of a second post. Count Arvid Horn (6 April 1664 – 17 April 1742), who was named a Privy Councillor in 1705 and a Count, in 1706, under absolutist King Charles XII‘s reign, distanced himself from absolutism. After the death of Charles XII (b. 17 June 1682 – 30 November 1718 [aged 36]) an absolute monarch, Arvid Horn transferred the power of the Queen, Ulrika Eleonora, to the Riksdag of the Estates, a ‘parliament.’ In other words, Sweden had a Riksdag of the Estates, but under an absolute monarch, the Swedish Riksdag had no power. This could be described as the flaw in Sweden’s early democracy. The king had died and Arvid Horn could shift his power to the Riksdag of the Estates, but what if the king had not died? Therefore, we cannot compare Sweden’s Riksdag to Britain’s constitutional monarchy. In England, the death of a king or queen could not lead to the dissolution, or the near dissolution of Parliament. In other words, in Britain, power could shift from one party to another in Parliament, but the reigning monarch remained and laws received royal assent, a form of veto. It remains that Sweden had a parliament before Montesquieu‘s Spirit of the Laws was published, anonymously, in 1848, and placed on the Index (list) of prohibited books, the Index Librorum Prohibitorum, promulgated by the Roman Catholic Church, in 1559. Consequently, when king Charles XII was killed, Sweden had its Riksdag of the Estates. Had it not been for the existence of the Riksdag of the Estates, however imperfect, Arvid Horn, President of the Privy Council Chancellery of Sweden, could not have transfered the power of deceased absolutist King Charles XII to anyone. Between 1719 to 1772, the Riksdag ruled Sweden. Two elected kings would ‘reign’ during this period. Queen Ulrika Eleonora succeeded Charles XII, but abdicated in favour of her husband, elected King Frederick I of Sweden because no power was vested in the Monarchy. Frederick I of Sweden and Ulrika Eleonara had no children. Empress Elizabeth of Russia agreed to return part of Finland to Sweden, if Adolph Frederick of Holstein-Gottorp were elected King of Sweden. Empress Elizabeth of Russia also chose as her heir the future Peter III of Russia, Catherine the Great‘s husband. Adolph Frederick of Holstein-Gottorp would be the Age of Liberty‘s second king. King Adolph Frederick of Holstein-Gottorp was a rather weak king. However, he was the husband of Louisa Ulrika of Prussia (Frederick the Great‘s sister), who believed in the divine rights of kings and wanted to reinstate absolutism. She put pressure on her husband, Adolph Frederick of Holstein-Gottorp. Adolph Frederick attacked the Riksdag of the Estates twice. The first attack was the Coup of 1756, which failed. The second attack was the more successful December Crisis of 1768, when Adolphe Frederick refused to sign state documents and abdicated. When Adolph Frederick of Holstein-Gottorp abdicated, Sweden’s Riksdag of the Estates was weakened, but it stayed afloat. In 1772, King Gustav III used a self-coup to reinstate not absolutism, at least not at first, but enlightened absolutism, modeled on his uncle Frederick II the Great of Prussia’s enlightened absolutism. Gustav III’s self-coup ended the Age of Liberty. Absolutist King Gustav III would be assassinated in 1792, a year before King Louis XVI of France was executed by guillotine, on 21 January 1793. In short, during its Age of Liberty (1719-1772), Sweden had two kings, but they did not rule, another flaw. The ruler was the Riksdag of the Estates, a form of parliament which consisted of two parties, the Hats (les Chapeaux) and the Caps (les Bonnets). One could dominate the other. The Caps (les Bonnets), under the leadership of Arvid Horn, threw their lot in with Russia or they remained more or less neutral. Count Arvid Horn’s increasing neutrality was opposed. So Arvid Horn retired to his home, Ekebyholm Castle. As for the Hats, they chose to ally themselves with France. They waged war against Russia, the Russo-Swedish War of 1741-1743, and participated in the Seven Year’s War. These were disastrous wars for Sweden. In 1809, King Gustav III’s heir, King Gustav IV of Sweden, lost Finland to Russia. 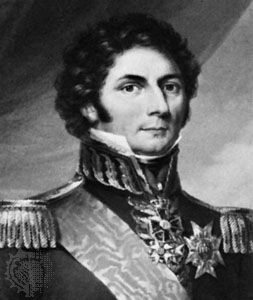 His defeat in the Finnish War prompted a revolt: the Coup of 1809. Gustav IV Adolf was forced to abdicate and to go into exile. On 6 June 1809, Sweden’s National Day, the Riksdag of the Estates and King Charles XIII adopted the Instrument of Government that remained in effect until 1974. Charles or Carl XIII was childless, hence the search for a crown prince. As we know, Jean-Baptiste Jules Bernadotte was elected crown prince of Sweden who would reign as Charles XIV John of Sweden. Time flies. So I am not altogether finished a post on Sweden’s Age Liberty which began a little before Peter the Great defeated the Swedish Empire and ended in 1821 and lasted until Swedish King Gustav III‘s self-coup of 1872, which takes us to the House of Bernadotte (27 September 2018). I thought of writing a little in-between post introducing Alexander Borodin, one of The Five (composers), or The Mighty Handful, whose goal was to capture the very soul of Russia’s culture. They gave Russian music its idiom. The Five are Mily Balakirev (the leader), César Cui, Modest Mussorgsky, Nikolai Rimsky-Korsakov and Alexander Borodin. All lived in Saint Petersburg. Borodin is exceptional. He was a doctor and scientist. Music was not his profession, but who could tell? His lyricism is a major characteristic of Borodin’s compositions and these are numerous. In the Steppes of Central Asia has an exotic flavour. It is a tone poem, one continuous and rather short piece of music. The piece I selected does not feature bells. It therefore differs from Modest Mussorgsky‘s Night on Bald Mountain, Une nuit sur le mont chauve, 🎶which is the very first piece of music I was introduced to. Among my early memories of the red brick house are my father’s late night gatherings with music lovers. Chauve means bald. We could see chauves-souris (bats) flying about. So, we will not hear bells in Borodin’s In the Steppes of Central Asia (Mongolia), composed in 1880. However, a wide range in volume is typical of the music of the Five, and Borodin’s. My main source is Wiki2.org.’s entry on Borodin’s lovely piece and my own knowledge. I have studied music, every aspect, all my life. In my last post, credits for the image above were left incomplete. I tried to add the name of the artist, but could not access the post. The artist is Vladimir Borovikovsky. The portrait is housed in the Tretyakov Gallery, in Moscow. Moreover, the link to Britannica’s video on Catherine the Great was moved. Mussorgsky was one of The Five (composers) (the Mighty Handful) who attempted to give the music of Russia a typically Russian idiom. Remember the bells.